It is a basic need in my life, to be clean and to feel clean and it really isn’t asking a lot. Yet when I pop into Boots and Superdrug the shelves are lined with so many shower gels to choose from in lots of different scents to clean your body with and to make it feel and smell nice but when it comes to feminine hygiene products there isn’t as much of a choice available. This is ridiculous really considering we all have sensitive areas that need to be cleaned just as much as the rest of our body. When it comes to feminine hygiene products, Femfresh are really flying the flag as the market leading brand because they offer the most choice I’ve seen out there and after trying out various products, they really are the best there is. In the past I’ve talked a lot about the travel size bottles of Femfresh on my blog because I think they’re an essential part of my travel toiletry bag whether I’m camping in the lakes or on safari in Kenya but today I wanted to share with you a selection of their full size products. These are just as much of an essential in my shower as my shampoo and shower gel and I love that Femfresh offer a variety to choose from and while they all do pretty much the same job, they’re all a little different. First up is the Femfresh Daily Intimate Wash which I first tried and loved in the travel size and now I have the 250ml bottle. This one is a very gentle, gel like wash, containing soothing and calming aloe vera, that is suitable for use everyday. Using a product specifically designed for your intimate area is really important because normal body washes can disturb the pH balance of the area causing discomfort and irritation. The intimate area usually has a low pH level which helps to protect it against irritation and Femfresh helps to keep the pH balance at this healthy level. The Femfresh Daily Intimate Wash cleanses the skin without making it feel dry and irritated because it is free from soap and helps to soothe the skin. It doesn’t have a strong scent but leaves you feeling fresh, clean and banishes any unpleasant odour. It is priced at £2.99 and is available here. Next up is the Femfresh Ultimate Care Active Fresh Wash. I believe this is a fairly new addition to the Femfresh intimate skincare line and I reviewed it back in April along with their deodorant which is an absolute favourite of mine, particularly when I’m travelling or exercising. You can read my full review here. 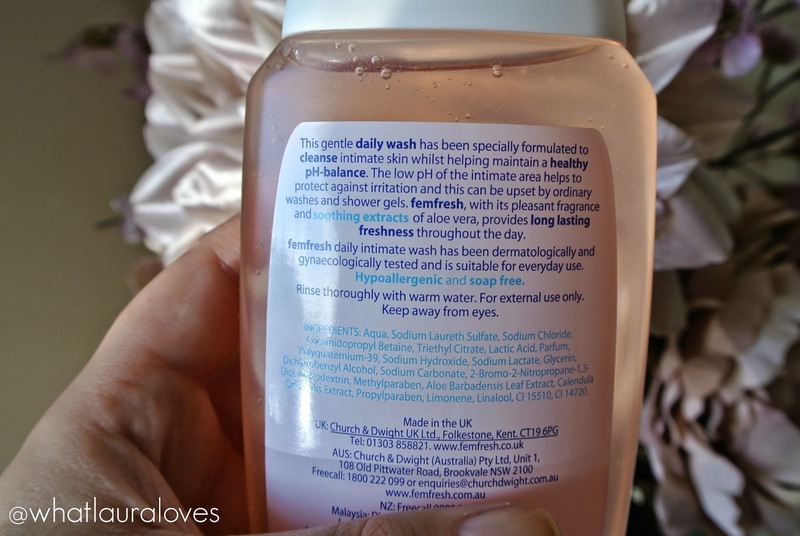 This is one of my favourites out of all of the Femfresh washes because I find it the most effective at neutralising odour and making my feel really clean. This is the one that I use after I have been to my belly dancing fitness class and if you’re a gym go-er then I’d really recommend it for your wash bag. It has this silver ion technology which is why it keeps you so fresh. Natural originating silver ions have very strong antibacterial and deodorising properties that work with your body to help it become and stay fresh and anyone can benefit from it in this wash, even those with the most sensitive of skin. 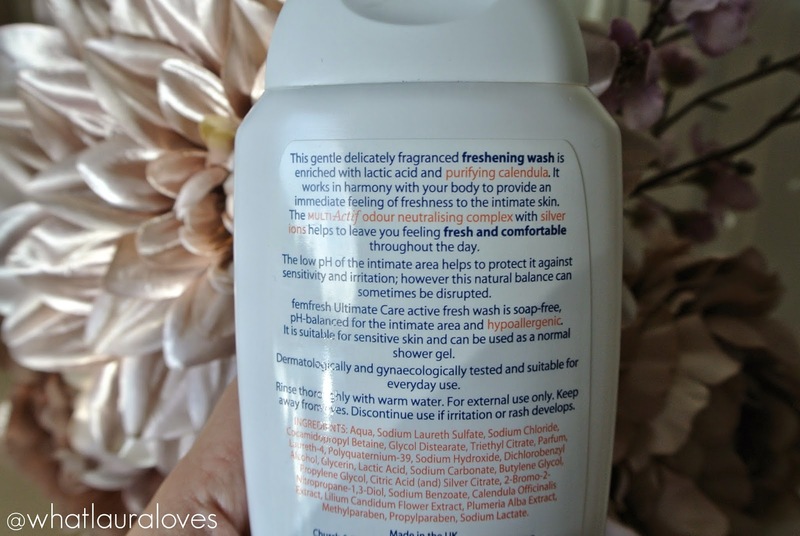 What I like the most about the Femfresh Ultimate Care Active Fresh Wash is that it can actually be used all over the body and it will keep your whole body feeling and smelling fresh all day long. It is gentle and wont irritate your skin, after all it has been formulated specifically for use on your sensitive areas. I don’t know of any shower gels that I would trust to use down there so it is great having a product that I can use all over. When I pick a body wash, I tend to like awakening, zingy scents but these aren’t great to use on intimate areas not only because they can upset the pH balance of the area but also because of their scent. If any of you have ever washed using the Original Source Mint Shower Gel then you’ll know exactly what I mean… burn baby, burn. This wash has a slightly more noticeable scent than the Daily Intimate Wash and it is slightly more milky in colour but they are used and perform in the same way. The Ultimate Care Active Fresh Wash is £3.69 here. Next is the Femfresh Ultimate Care Pure and Fresh Gel Wash which is another preferred wash of mine for after I have exercised because it has a slightly stronger fresh scent than the Daily Intimate Wash and I find that that gives me the feeling of being even cleaner, making it great for use particularly when it is that time of the month. It is packed full of ingredients from natural origins and you can use it everyday in your shower, just as you would with a regular soap or shower gel. As with all of the Femfresh products, this intimate body wash is dermatologically tested and also gynaecological tested, unlike the usual soaps and shower gels that you’ll find in the shops. This way, you can ensure that what you’re using is suitable for your most sensitive area. The Femfresh Ultimate Care Pure and Fresh Gel Wash is available for £3.69 here. Last but by no means least is the Femfresh Ultimate Care Soothing Wash which is my absolute favourite wash product from Femfresh. Like with the other Femfresh products, this hypoallergenic wash can be used as a shower gel too and it is my favourite one to use in this way because I really like the scent of it; very girlie and a little fruity. It contains probiotics to stimulate natural defences as well as moisturising and protecting cranberry oil. My friend actually recommended this wash to me because it is her favourite to use. She’ll remain nameless for what I’m about to tell you but she is someone who suffers from recurrent cystitis and so she really needs to be careful of what products she uses down there. She absolutely swears by the Femfresh Ultimate Care Soothing Wash and even uses it in place of shaving gel when preening the rose garden so to speak. Again, I think this is a great one to use, particularly if it is that time of the month and it is available for £3.69 here. 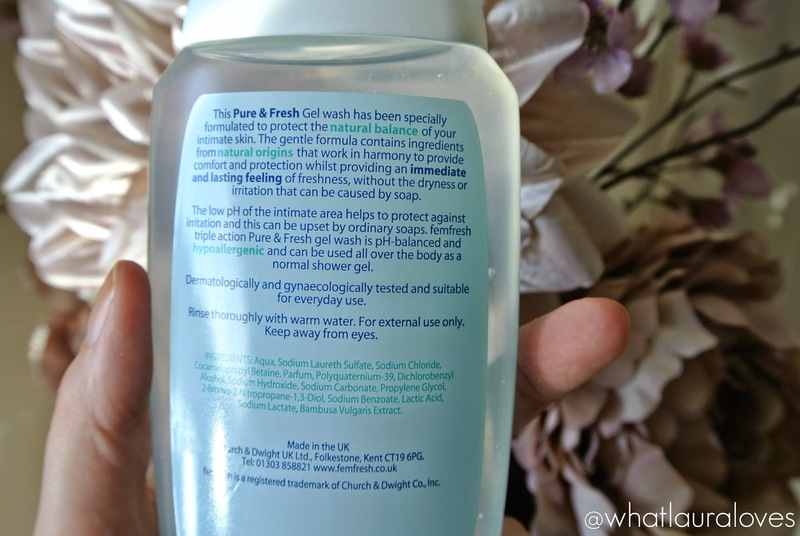 While I have reviewed each Femfresh product here separately, I do think that they’re all much of a muchness because they all perform exceptionally well and do exactly what they say they will on the bottle. Ultimately, you need something that is going to be gentle and effective without disturbing the pH balance of your skin and causing irritation. Femfresh ticks all the right boxes so it is just up to you to find the one that you like the most. My two favourites are the slightly more milky washes; the Active Fresh Wash for after exercise and the Soothing Wash for daily use, particularly when feeling a little more sensitive than usual, mostly because I like the smell of it the most! You can visit the Femfresh website for more information on these products and all of their other ones. What are your favourite Femfresh products?